Well, spring was pretty great, but it’s wheat beer season and we’re ready to relax on the porch with a few delicious craft beers. Deep gold, thin head, aromas of bread and spice, zesty on the palate with bread, citrus, and honey. Pretty good kick for a white, too. Orange side of gold, lasting head. Highly carbonated. Honey, hay, and citrus on the nose, light, vibrant hops on the palate. Golden colour with gigantic head. Honey, white pepper, and must on the nose, champagne and vanilla on the palate; you wouldn’t think it’s as strong as it is. Crimson with a thin ring of a head. Sour cherries and oak on the nose. The palate is all molasses and sulphur—so sour, you’ll only be able to sip. 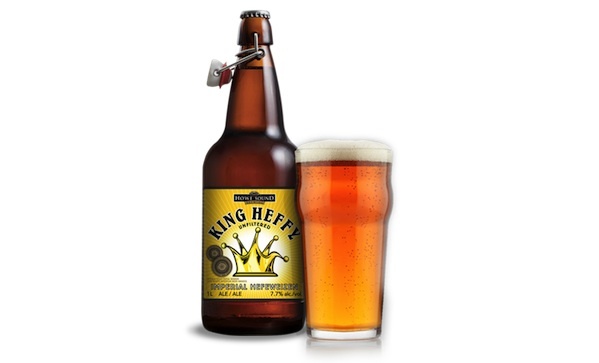 King indeed; for such a beefy bottle, this is a light German style wheat beer. Foggy orange, aromas of banana, wheat, and cloves, with a good balance of floral notes and spices on the palate. You’ll want to split one of these guys with buddies at the driving range. Golden with robust head. Spicy nose cut with yeast. Highly carbonated, clean on the palate. Yes, that Shawinigan handshake. Muddy orange, white head. Peach and citrus on the nose, tart on the palate; it tastes like a Chretien victory lap.